(Photo: © Peter Williams)Christian Orthodox pilgrims on the Via Dolorosa in Jerusalem's Old City on Good Friday, April 2, 2010. In Jerusalem Good Friday was not only busy for Christians. 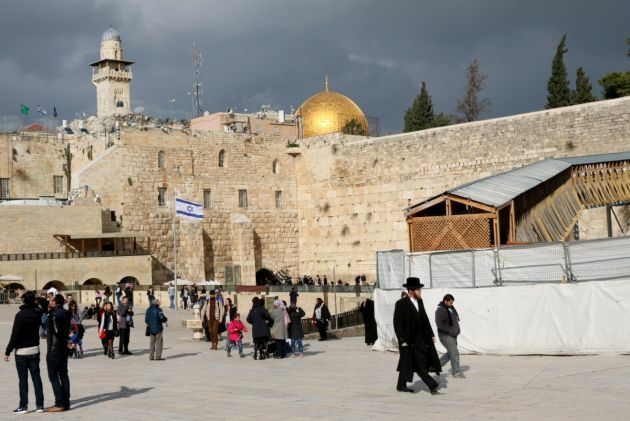 Muslims and Jews thronged Jerusalem's Old City on Friday with them, navigating police barricades in the narrow alleyways clogged with procession worshippers. Christian pilgrims commemorated Jesus' crucifixion retracing his last steps along the Via Dolorosa, or the "Way of Sorrow" in Jerusalem. They also held services and in churches throughout the world. 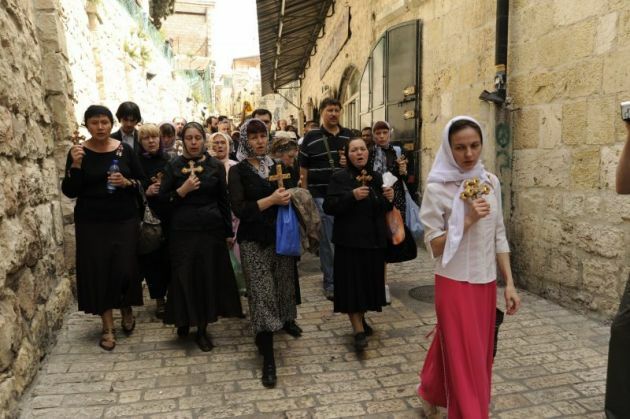 In Jerusalem the thousands of pilgrims sang hymns and reading from the Gospel along the 14 Stations of the Cross with some worshippers bearing their own large wooden crosses on their shoulders, dpa reported. The turnout was especially big this year because the Eastern Orthodox and Western churches, which use different Roman calendars, are observing Good Friday and Easter at the same time. Muslims made their way to the Al-Aqsa Mosque for Friday prayer while thousands of Christian pilgrims along the Via Dolorosa held up Jews heading to the Western Wall in crowded Jerusalem. During Holy Week Jews celebrate Passover or Pesach as it's also known, a festival celebrating the freeing of the Israelites by Moses from slavery in Egypt and lasts for eight days until April 18. In Alexandria, Egypt members of Egypt's Christian minority flocked to church on Good Friday but two church bomb attacks on Palm Sunday that killed 45 people have left many in a somber mood over Easter, Reuters News Agency reported. Worshippers from the nearly 2 000-year-old Coptic Christian community attended church services, but church official said Good Friday was being observed in subdued fashion. The Egyptian government needs to do more to protect Coptic Christians from a "wave of persecution" the following bombings said Bishop Macarius, head of the Coptic diocese in Minya, south of Cairo. He was skeptical that a state of emergency imposed after the Islamist attacks on Palm Sunday was adequate security and said the church wanted further guarantees, Middle East Monitor reported April 14. Copts account for some 10 per cent of the 92-million population of mostly Muslim Egypt and are the region's largest Christian group, having a nearly 2,000-year-old history in the country. Good Friday commemorations were marred after the stabbing of a 21 year-old University of Birmingham student on a tram near Jerusalem's Old City. A 57-yeard-old Palestinian man was detained for stabbing to death British exchange student Hannah Bladon on a tram at Tzahal Square. She was on an exchange at the Hebrew University of Jerusalem, taking classes in bible studies, archaeology, and Hebrew at the Rothberg International School. Police say the suspect, a resident of Ras al-Amud in east Jerusalem, was recently released from a psychiatric hospital and Jerusalem police chief Yoram Halevy told AFP that the man was "very mentally disturbed," according to the BBC. An off-duty policeman travelling on the tram pulled an emergency brake and then tackled the attacker, with the help of another passenger. He told AFP: "I was travelling with my family when I heard the cries of 'attack, attack'. I sounded the alarm then rushed to the scene of the attack. We overpowered him." In Rome Pope Francis presided over the Stations of the Cross at the Colosseum on Good Friday, asking Jesus' forgiveness for the ways we may have fallen short, and imploring the grace to do better in the future, Catholic News Agency reported. "O Christ our only Savior, we come back to you again this year with eyes downcast with shame and with a heart full of hope," the Pope prayed April 14. "We ask you to break the chains that hold us prisoners in our selfishness, in our voluntary blindness and in the futility of our worldly calculations." Francis recalled the different reasons we may have for bringing our shame before Christ on the cross, such as the bloodshed of women, children, and immigrants, or the persecution of people based on race, ethnicity, or religion. (Photo: © Peter Kenny / Ecumenical News)The Israeli flag flies at the Western Wall, a Jewish Holy site, next to the Al-Aqsa Mosque one of Islam's Holy sites in Jerusalem on Feb. 11, 2016.